A 5k run, an ugly sweater contest, and a plunge into the icy waters of the Horsetooth Reservoir in January. Who in their right minds would want to do this? Psychology doctoral students, it turns out. 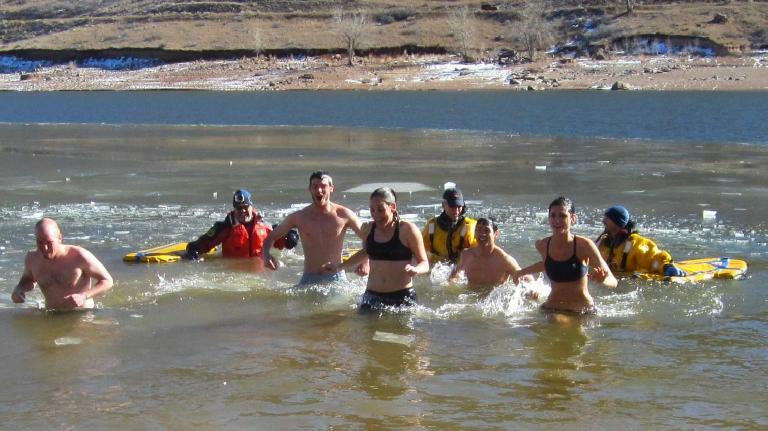 Of all the friends I asked, they were the only ones who would join me for all the Front Range Freeze events. Fittingly, then, our team was named Psycho Sabihondos. Perhaps it required a certain mix of mind-over-matter and looney-tune psychosis. Psycho Sabihondos consisted of my friends Casey, Danielle, Kevin, Kyle and myself. 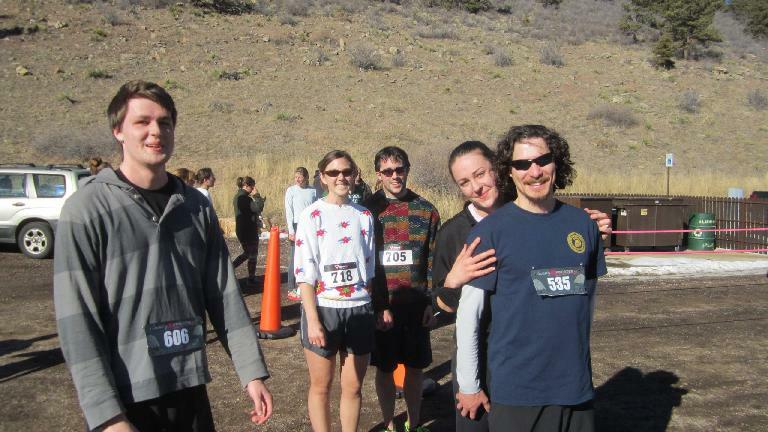 Some other friends formed a 5k-only team called the Greek Tragedians, including Andrew, Hector and Katherine. 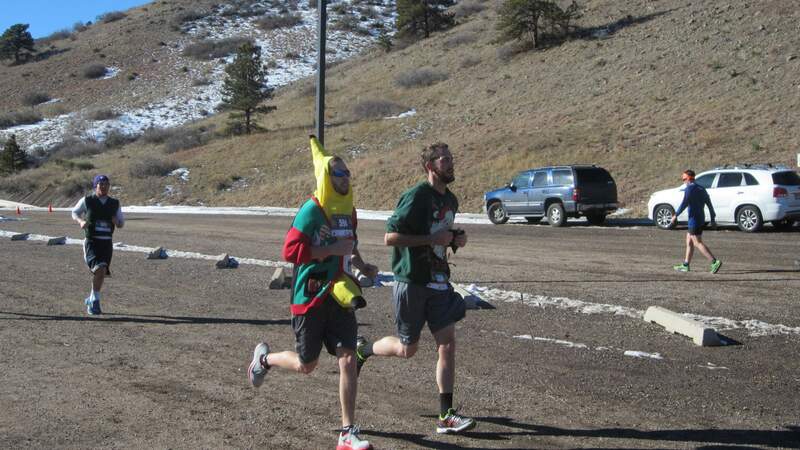 Dani and Nick also ran the race. 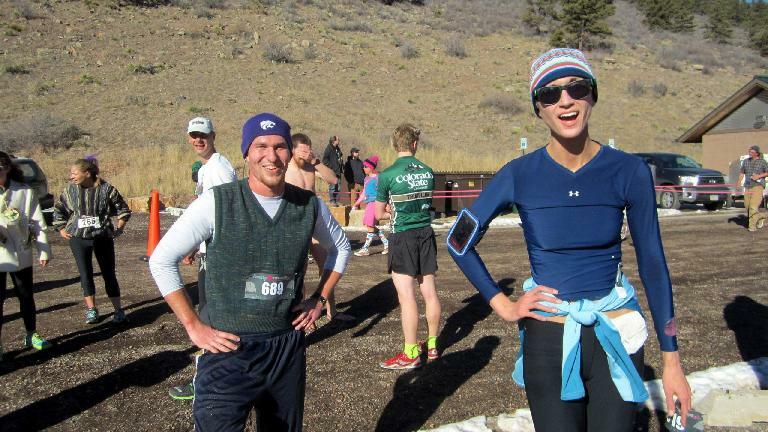 The race started out with co-race director Ron apologizing to all for the sun and 40-degree temperatures instead of, say, -6F, and also trying (unsuccessfully) to get the person in the grimacing Polar Bear costume to run the race too. 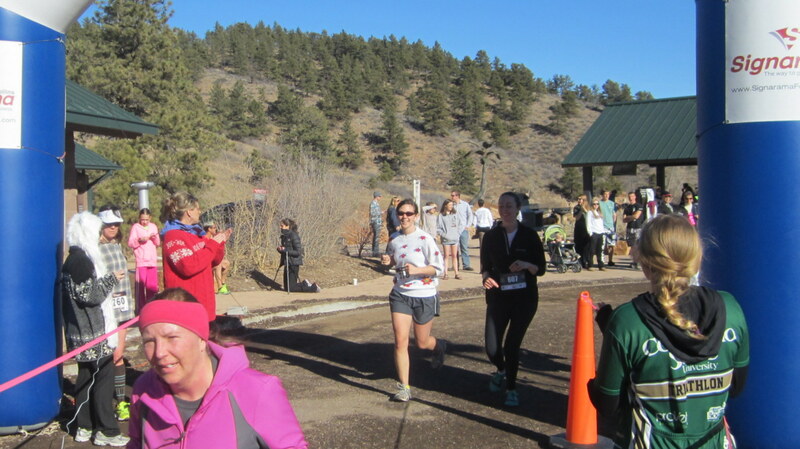 Wearing my trail-running shoes for this out-and-back course featuring five short but significant hills, I started out in front, but was quickly gapped by over a dozen front-runners. 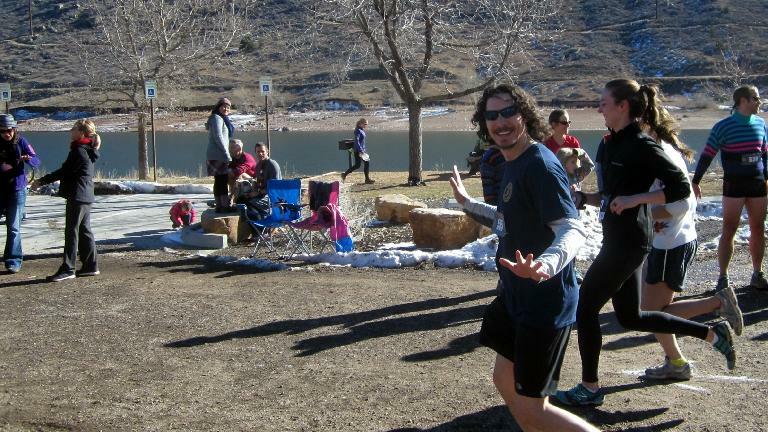 I’ve never run rolling or hilly courses particularly well (finishing my last hilly 5k in a disappointing 22:15), but with all the speedwork I’ve done in the last three months, I was determined to give it an honest Tasmanian Devil-like performance. As it turned out, I started the first mile well, the second mile just hanging on, and by Mile 2.5 mile (and the last uphill) I was reeled in and passed by a runner in the 40-49 age group. 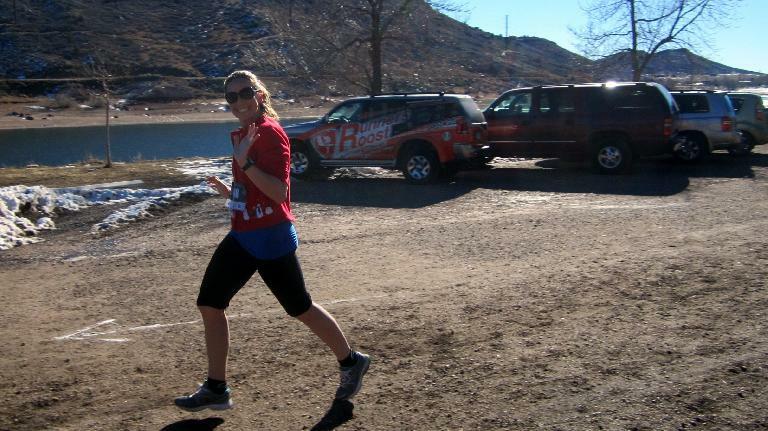 But then came a downhill, in which I was able to catch up to and pass as I commenced a quarter-mile finishing sprint. 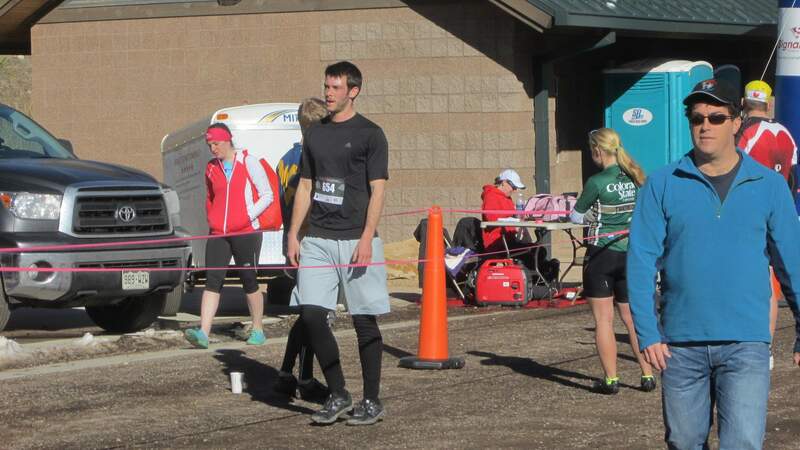 Ultimately I gapped the man by seven seconds and finished in sub-21 minutes. That’s a bit off from a personal best for this distance, but the best I’ve run a 5k with over 120 feet of elevation gain. I was pleased. The rest of Psycho Sabihondos and the Greek Tragedians all came in within the next 3-10 minutes. All of them were smiling as they came into the final 100 meters. For a few of my friends, this was their first race of any distance. Congrats! 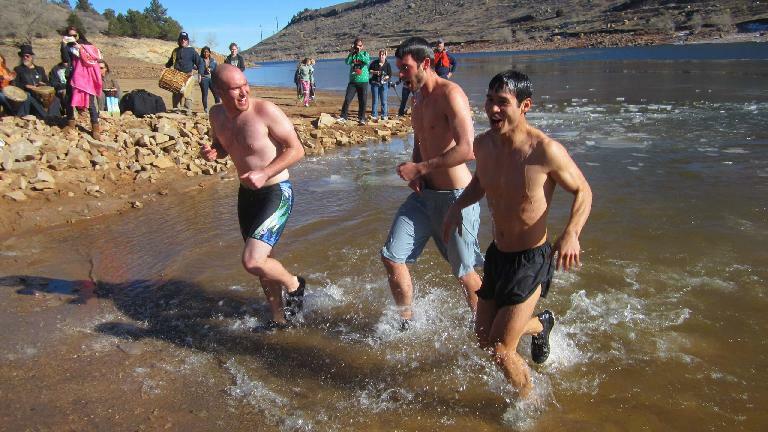 Then came the event everyone was most looking forward to: the Polar Plunge. 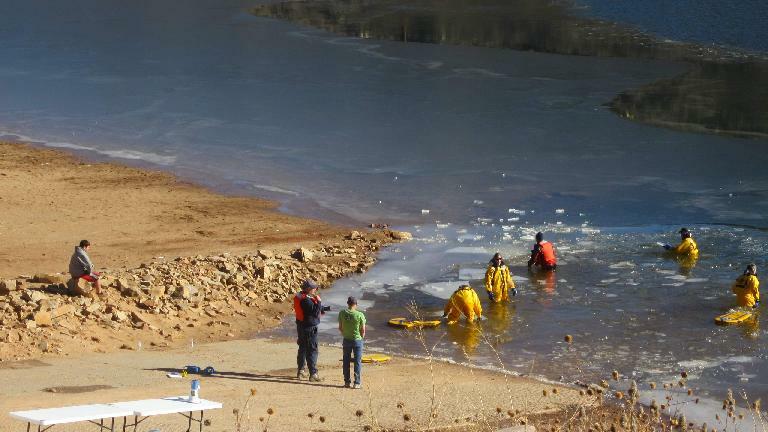 In August 2009, I thought the water in the Horsetooth Reservoir was cold; hence, it sent shivers down my spine just thinking how cold it was going to be in January. A sheet of ice on the surface was an early indicator. 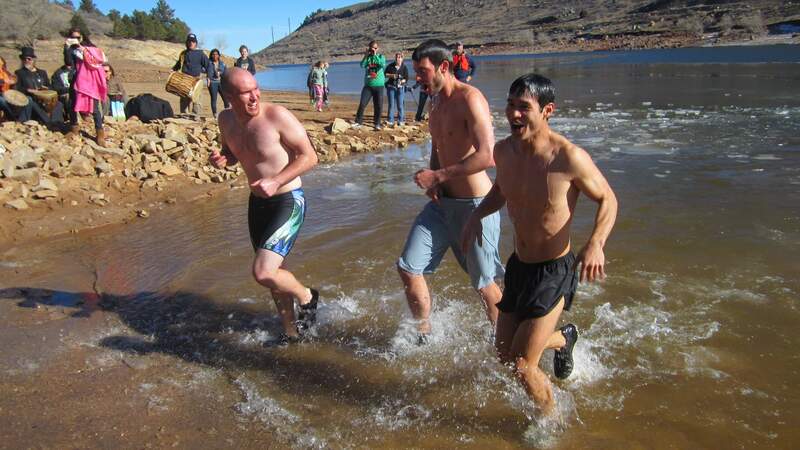 The air temperature by the time of the event, however, was low 50s. More importantly, it was sunny. 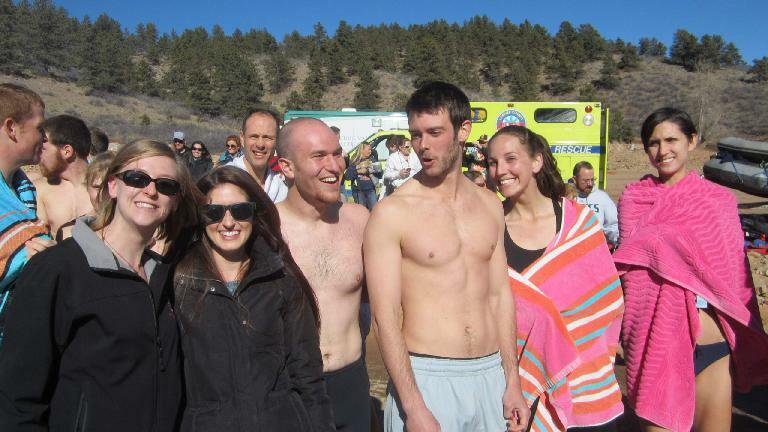 So all of us were reasonably warm standing around shirt- and pant-less. 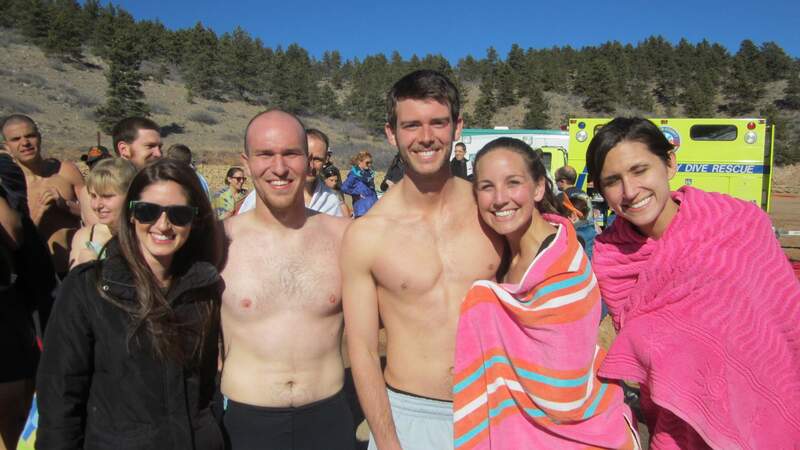 Moments before the plunge, our friends Jaclyn and Kyla came over to watch and cheer. There was no backing out now. 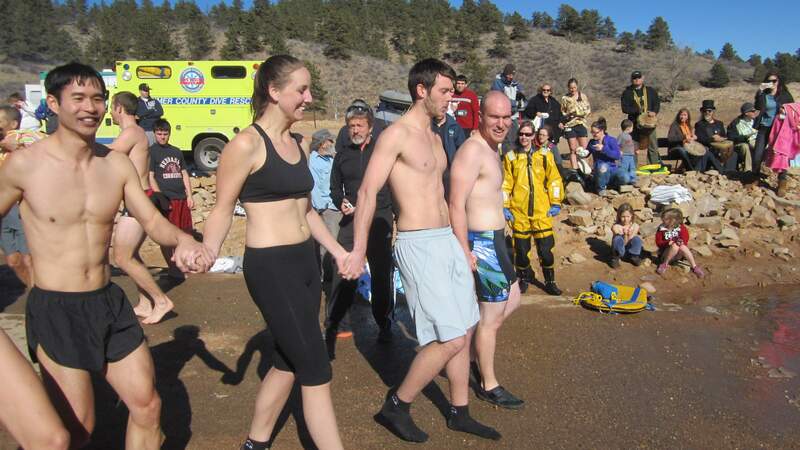 Our strategy was to hold hands, run into the water, submerge ourselves and swim the final meter or so to the three hardy folks who were part of the Larimer County Dive Rescue Team. When it was time to go… surprise! The water wasn’t quite as cold as I imagined, and in fact I’d say jumping into a cold swimming pool on a hot summer day has caused more cardiogenic shock than running into the icy water. Perhaps it was due to adrenaline pumping through our veins, but I thought even the full submersion and swimming part in the water was not that bad. “Refreshing” is more how I’d describe it. And before a minute had elapsed, we were out of the water and all smiles. We did have one casualty, though. 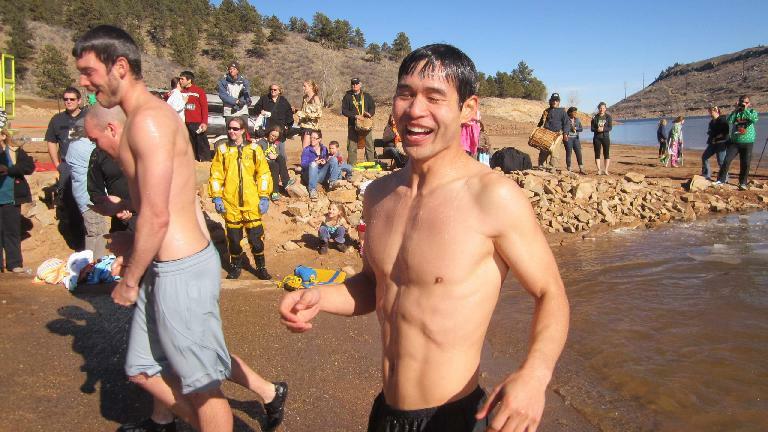 Kevin, apparently, had encountered a bit of ice as he tried swimming through the water, cutting his forehead in several places. 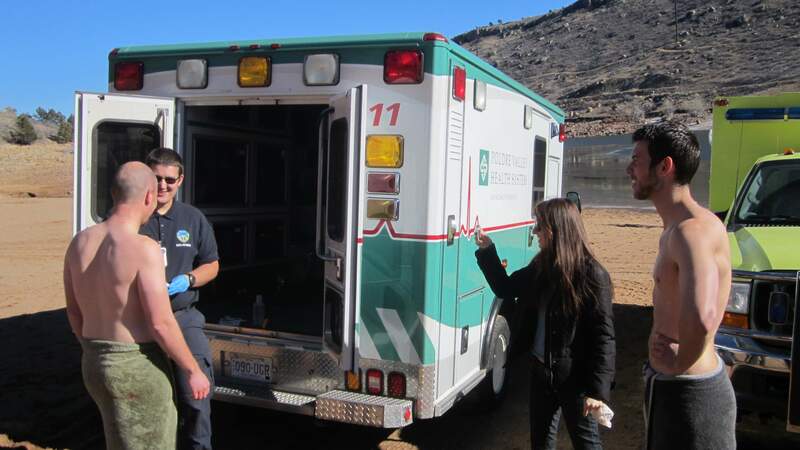 “When I got out of the water, the first thing I noticed was my lip was swollen,” he said. “Then after I touched my face and looked at my hands, I saw blood.” He was a bit bloody all right. He was a true sport about it, though. 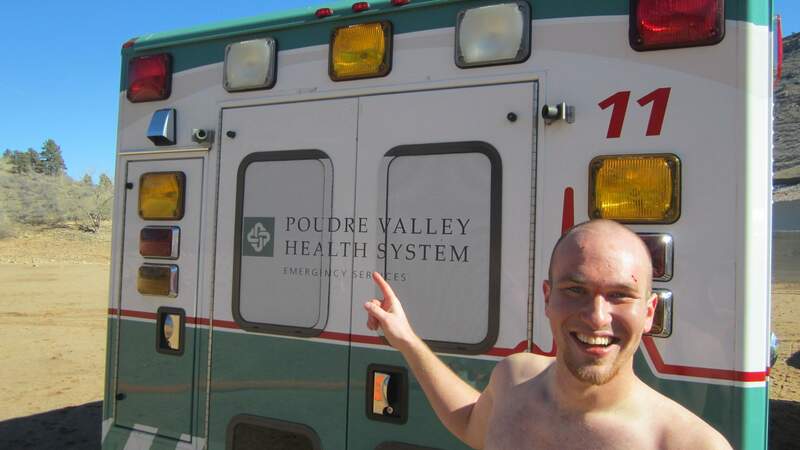 And as we looked for some EMTs to help disinfect the cuts, he posed with an ambulance on hand for pics. Fortunately, the cuts were small and he ended up fine. All in all, this was a super fun event and we were pretty much unanimous that this is something we’d do again. Maybe next year I could even get some other friends who aren’t psychology specialists to join us.